‘I try so hard to hold onto pleasant images of Tim, but all I can see is him hanging there in the garage.” So said my sister a few months after our older brother died of suicide. That was one comforting linguistic suggestion, that he “died of suicide,” not that he “committed suicide.” But there is little comfort when a family member dies at his or her own hand. At the funeral, Sister Rosemarie, the Franciscan who has served so many years in Camden, N.J., with grace, courage and compassion, told me: “You have to write about this. You need to help people who suffer this.” I learned a long time ago to do whatever the sisters tell you. Still, this is a difficult writing assignment. None of us want to be here today. Least of all Tim. And the last word is really the word we all have for Tim: love. We loved him. He was lovable. He was funny and fun. But he was also tortured and hurting, much more than we ever knew. To read the notes he left reveals a soul in searing pain. Several years ago, at the university where I work, a first-year student’s dad committed suicide. I had to break the news to the kid. His mother was out of town and the local police hadn’t been able to contact her. They didn’t want the young man getting the news by text or Facebook. It was not easy to tell him, but at least we got the young man through that evening. I take some consolation in the fact that the Catechism of the Catholic Church clearly teaches that “we should not despair of the eternal salvation of persons who have taken their own lives” [No. 2238]. By ways known only to God they can be helped and healed. We cannot give up hope for Tim. As the Gospel attests, God searches out and saves the lost. The hard but true reality is that no one can stop someone who decides to die by suicide. When my brother died, part of me, part of all of us, was hurting and angry and confused and wishing we could have done something to prevent his act. But in my more prayerful moments, I hear how much hurt was howling in my big brother. And I realize there is nothing anyone could have done to stop this. As much as I’m shocked, stunned, angry, hurt and sad at how he ended his life, to put ourselves in his skin provides another perspective. Fires burned within him. Searing flames scorched his soul. He was in deep distress: long-term psychic pain, years of struggling with feelings of failure, days and days in the depths of depression. What many of us saw in public were the highs. His wife, Maureen, and my mom were witnesses to his lows. The notes he left revealed the depths of his agony. All his friends and family, especially his three boys, loved Tim. But we couldn’t save him. Now we must depend on God to save him, heal him, transform him and make him happy and healthy and holy and free. That’s the promise of our faith. That God can and will save and transform us. Most important, let’s not let the last six minutes of his life make us forget the previous almost 60 years. Keep your favorite images and memories of Tim present in your mind and heart. That is some of what I said that day. In the months since, I’ve learned some more. Suicide causes a particularly pulverizing pain. Like all death, suicide stings. Yet there is something about suicide that hurts more acutely. Suicide stuns and scars us. Suicide of a loved one is a particularly painful cross to bear. There is a welling up of agony and despair that, for me, can only be held off and eased by prayer. Our faith tells us we will see again our loved ones who have died. We hope God will achieve in the next life what was not able to be achieved in this one. Jesus finds and saves the lost sheep. We hope and wait with endurance for God’s saving grace and mercy in our lives. This is our hope. This is our faith. Many factors predict that a person may be at risk for suicide: mental illness of many kinds, especially depression and severe hopelessness; alcohol and drug abuse; family history of suicide; and previous suicide attempts. Job loss, divorce or the loss of a loved one are often too much for someone contemplating suicide. My brother took his life less than two weeks after we buried our mother. The phenomenon of suicide contagion is well known. If a suicide occurs in a high school, the principal and counselors immediately begin to monitor closely other troubled kids. About 10 percent of all suicides in the United States are contagion or copycat events. Each year some 35,000 to 40,000 Americans die of suicide. In 2010, there were 38,364 suicides reported in the United States. That is one every 13.7 minutes. There are more suicides—the 11th leading cause of death in the United States—than homicides, the 15th leading cause. For young people ages 15 to 24, it is the third leading cause of death. Suicide among young adults has tripled in recent decades. More than 50 percent of suicides are by men between the ages of 25 and 65, and more than 50 percent of suicides are by firearm (a gun in your household has a much higher chance of killing someone you love than it does of harming an intruder). Male suicides outnumber female suicides four to one. More women attempt suicide than men, but men are more likely to complete suicide. While 80 percent of those who seek treatment for depression are treated successfully, many who complete suicide never sought professional help. The depressed and mentally ill often become so distorted in their thinking that they convince themselves that the world will be better off without them. They believe their suicides will stop them from being burdens for those who strive to help them. About 20 percent of people who frequently attempt suicide eventually complete it. My brother had checked himself into a suicide prevention unit five years before he finally ended his life. One common phenomenon is that those who struggle for years can all of a sudden seem fine. You often hear, “I just saw him last week. He seemed really good.” Experts theorize that such persons have finally decided to end their life. They know their pain will end. They relax because they know it will soon be over. There are many options available for individuals considering suicide. 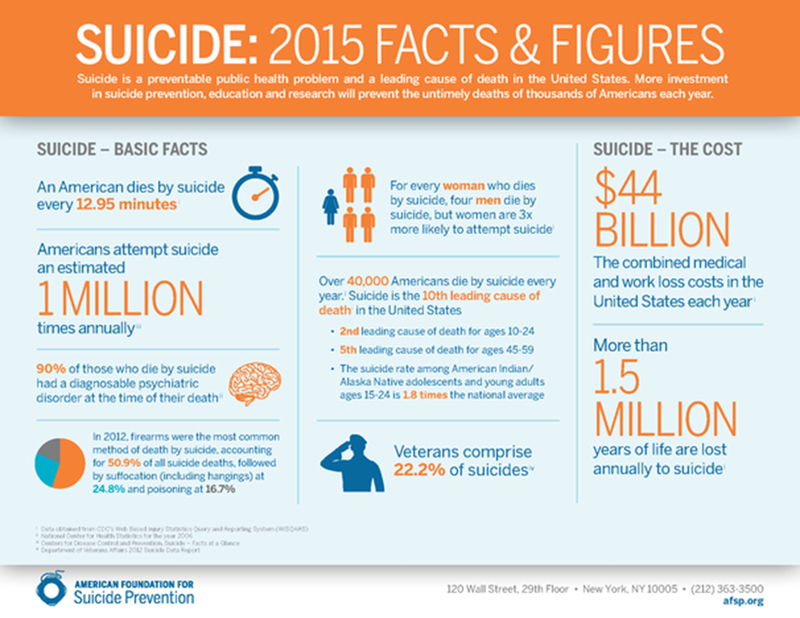 The American Foundation for Suicide Prevention provides helpful information. If people speak to you of being suicidal, ask if they have a plan and/or means to carry out the act. If so, get them help. Do not leave them alone. If someone you know is feeling suicidal, or if you are feeling suicidal, call the National Suicide Prevention Lifeline (800-273-8255). As Catholics, we believe that transformation comes through the crosses of life. There is no resurrection without the cross, which means there is no cross in life that does not contain within it the seeds of resurrection. Let us pray for hope and for the grace to trust in the promise of resurrection for all our loved ones “who have gone before us marked by the sign of faith,” especially those so troubled and tortured that they took their own lives. Thank you for such a thoughtful article on a difficult subject. I am saddened that you did not mention the inordinately high level of suicide among gay and lesbian teens and young adults. When a "different" sexuality is discovered and there is little of no help from family, other loved ones or the church, suicide is often the result. The church must bear the cross of inaction and rejection of those of us who are the "other." Thank you for this comprehensive article, which will surely help to educate others and to diminish the stigma associated with death by suicide. (And yes, we can dispense withe the term "commit suicide" -- those who die by suicide do not commit criminal acts.) As a mother who has lost an adult child to suicide, a pastor, and a suicide prevention activist, I know that you walk on holy ground when you share your story and thus make it possible for others to share theirs and to move forward. I re-read this article last night and realized that I had missed something. I do take issue -- strongly -- with your assertion that there is nothing we can do to stop someone who decides to die by suicide. It is difficult for those of us who have lost someone in this way to discover that, had we known and understood more, there are things we could have done -- but the same is true of death due to physical injury or illness. We may not know enough at the time, but as research develops and education -- of family and friends, of law enforcement, of medical and counseling and educational professionals -- continues, we find that there is lots we can learn and much we can do to change the trajectory of suicidal ideation, so that numbers of deaths and the tremendous suffering that follows are reduced. Maybe not for us, but for those who follow us. There is no comfort, and potential great harm, in the claim that suicides are inevitable. This article also appeared in print, under the headline "Still Seeking Hope," in the October 5, 2015 issue.